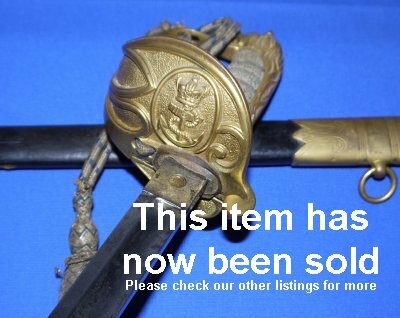 In good condition, an early 20th Century British Royal Navy officer's sword, with folding guard engraved to "H A Bickford, RN". Now with 20% discount. This is a good research project for somebody. 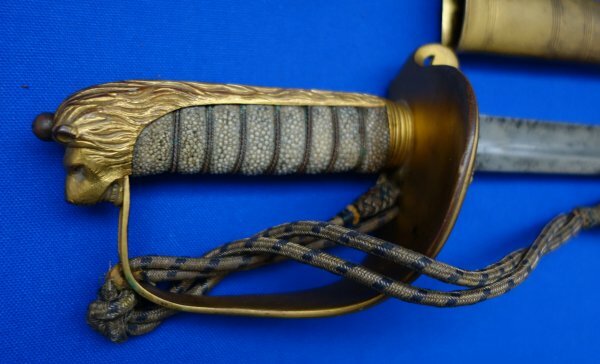 The sword has post-Victorian Tudor Crown to the hilt and is etched to "Matthews & Co Outfitters Portsea" which, according to our reference books, means the sword was made in 1901 to 1903. But we could not find any mention of H A Bickford on the Royal Navy list until WW2, when he served as a civil naval technical officer with the rank of Commander within the Admiralty's navigation section. The fact he had the rank of commander and that this sword's blade etching dates from the reign of Edward 7th or possibly George 5th (with Edward 8th onwards, they put the monarch's personal royal cypher to the blade; this one has only the British Royal Coat of Arms), shows that H A Bickford must have had some history with the Royal Navy and quite likely served as an active officer during WW1, but we can not find him before WW2. The 28 3/4 inch blade shows that Commander Bickford was a short man! Anyway, the blade is in overall very good condition but with some patina patches, and is firm in the hilt. 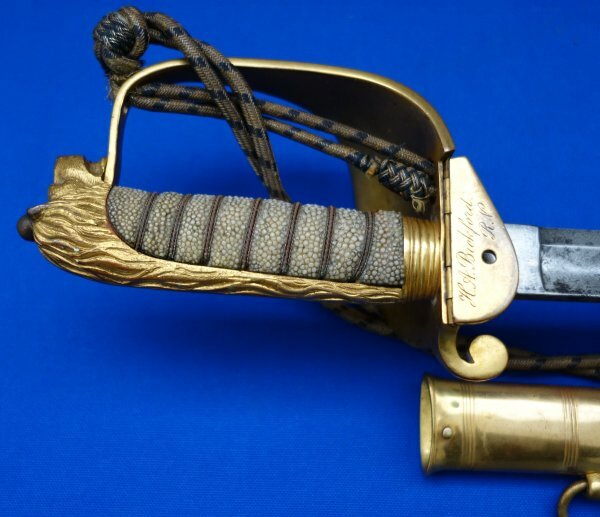 The hilt is generally very good, the folding guard with "H A Bickford, RN" engraved to it, works well and locates properly onto the securing pin on the top locket of the scabbard. The grip is a little grubby but overall very good, and the twisted grip wire bindings are also complete and good. 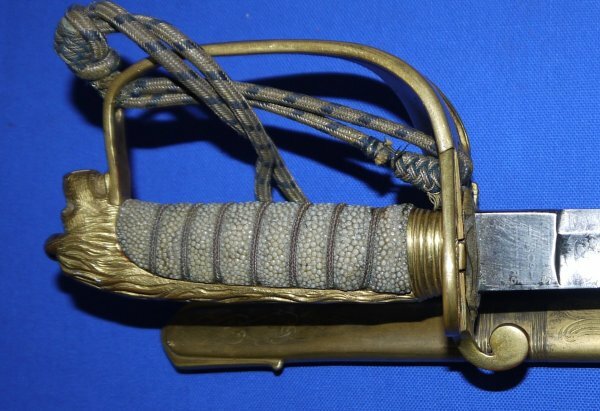 The original sword knot is aged but good; the same with the scabbard. The sword sheathes and draws well. A good sword with bags of research potential for only £? (too late, now sold). Please quote item reference K32 (1168). Further / full sized images available upon request.